Featuring unique glass eye designs, that I created digitally, these cabochons are sure to make your creations a hit! Perfect for doll or jewelry making. Made with high quality print-out of my digital design, and attached to a glass cabochon dome with diamond glaze resin and placed into a silver plated button bezel. This listing is for a pair of eyes. Reflections on the cabochons are from the lighting, there are none in the actual eye design. Designed and created by Megan's Beaded Designs. 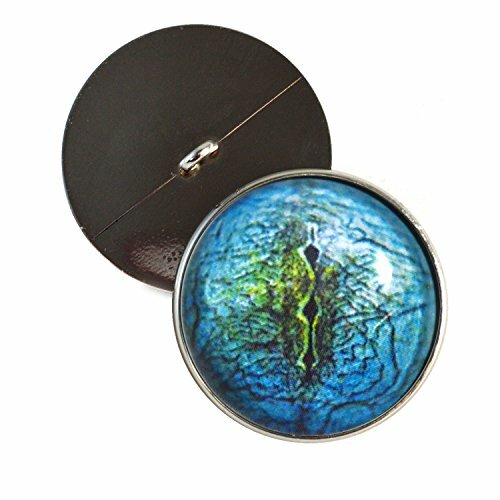 A pair of 30mm large blue lizard eyes with loops set in button bezels. These are unforgettable glass eye designs. They are sure to make your art projects a hit! Great for adding an enthralling element to your handmade stuffed animal, crocheted creature, art doll, or other soft sculpture project. Reflections shown in pictures are from the lighting reflecting off of the glass surfaces, there are no reflections in the glass eyes themselves. Glass eye cabochons are hand constructed and attached to silver tone button shanks with loops on their back sides. View More In Doll Making. If you have any questions about this product by Megan's Beaded Designs, contact us by completing and submitting the form below. If you are looking for a specif part number, please include it with your message.